DO YOU ASK YOURSELF THIS QUESTION WHEN YOU ARE ON THE GREEN? ASK NO MORE! Install a Personal Practice Training Area (Putting Green) in YOUR own yard. Impress your Friends & Improve Your Short-Game Scores. TJB-INC offers Synthetic Putting Green kits for people who enjoy hands on projects and the satisfaction of "doing it themselves". We offer our putting green surfaces in 12' or 15' widths. Lengths can be as short as 1' or as long as 100'. We also sell 3 styles of premium fringe which also doubles as a top-quality replacement for real grass in situations where synthetic turf is desired. Unlike our on-line competitors, we provide you with the most detailed information on each of the synthetic products that we sell so you can know exactly what you are purchasing. Use our information when shopping the different on-line stores. 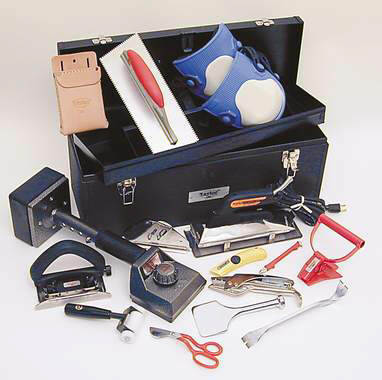 We sell direct from the mills, no middle men to mark up the products. Most turf orders will take about 7-10 business days to arrive at your location after placing your order. • Nylon & Nylon sand-filled synthetic turfs have "memory." The fibers are heat-set during the manufacturing process at 230 degrees and will resist becoming matted down by springing back to their original upright position for many years of enjoyable play. • Nylon synthetic turfs are much denser than our polypropylene sand-filled turfs. That is why our nylon products require zero to minimal amounts of in-fill. You can add in-fill materials if you wish to speed up the playing speed of the green if so desired or to add balast to help hold the material down..
• Nylon is also a much stronger fiber than polypropylene and will resist fading and wear in all weather conditions. This is why the pro-rated fade warrantee period is always longer for nylon, 8 yrs vs. 5 yrs. • Our sand filled nylon products have been specifically designed as excellent all-purpose turfs. They give you the best of both worlds - excellent shot receiving and superb putting performance. In addition, by adding a small amount of in-fill to your putting green, you can increase the ball speed of your green. • Nylon synthetic turf does not require maintenance after it is installed, unless you add sand or other in-fill during the installation. • Whether you choose an in-filled or non in-filled nylon turf, the surface of your green can be cleared of debris easily, by either blowing or sweeping off the surface. Nylon turf requires greater care in seaming, but proper installation will hide the seam well. It may be installed in many environments, including indoors. • Polypropylene is a form of plastic. 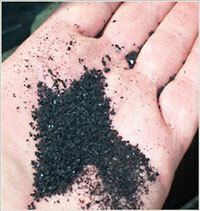 Most traditional polypropylene turfs require some in-fill to perform well. The newest polypropylene surface does not require usual in-fill to stand the fibers up because they are omni-directional like a premium nylon surface. • There are a couple of reasons why you need in-fill in a Traditional polypropylene turf. The most important reason is because the fibers cannot stand upright on their own. In-fill is also required to help prevent the fibers from becoming matted down. Adding the wrong in-fill to a putting green will equate to periodic maintenance, despite claims to the contrary. • Heavily sand-filled traditional poly greens can become hard over time, and will require a little more maintenance to provide good performance. These sand-filled turf products require 2-12 pounds of sand per sq. ft. (depending upon fiber length), and must be brushed and re-filled with sand if the sand-fill becomes compacted or washed away. To help eliminate the compaction issuses, try to use a uniform sized material for your in-filling applications. It will cost a little more, but it will not compact. • With the right sand-fill, Traditional polypropylene provides an excellent surface for receiving long approach shots. (The sand-fill helps disperse the energy of a ball when hit into a green from any significant distance.) The longer the fiber (IE: >2”), the more sand in-fill and the better holding capability the green will have for long chip shots (over 150 yds). • Putting on a sand-filled turf does have a drawback however. If not installed correctly, you might experience a "grainy" effect when you putt on a sand-filled turf. This means that the ball will roll faster with the grain than against the grain. This effect will occur with most polypropylene products that you choose reguardless of fiber length. The exception to this is our latest omni-directional polypropylene putting green turf. The only in-fill required is for balast to help hold the surface down. The fibers have been heat treated so the surface plays like a premium nylon green. It is highly recommended for practicing chipping and putting up to 50 yards. Note: Traditional Polypropylene turf has about a 4 to 6 week break-in period which may be accelerated by rolling or light plate tamping. 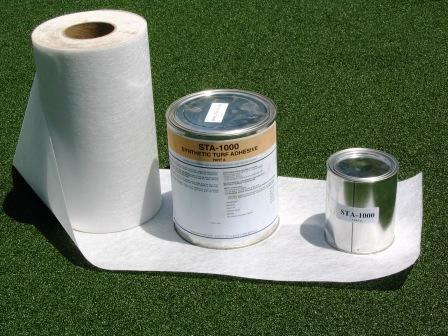 TJB-INC sells both Nylon & Polypropylene putting green surfaces factory direct. NOTE: Be aware, companies that market only Polypropylene greens will tell you how great their product is and how terrible Nylon is. The same is true for companies that market only Nylon greens. Each type of green has its Pros & Cons depending upon its use. Please use the above information & article below to help make your decision. TJB-INC also carries several styles of Fringe/Lawn turf. Our synthetic fringe/turf's have "water control" perferations in their backings to allow 100 gallons of water per square yard per hour to drain into the turfs substrate below. All products are safe for use with children and pets. Great for golf fringe, home lawns, dog runs/yard, pool decks, wood porch surfacing & more! Animal solid waste can easily be pick-up without any residual staining to the turf surface. Areas of the country with prohibitive water restrictions, will find our synthetic turfs as a great alternative to dead, dry grass, crushed stone, or bare dirt. Perfect for adding a different texture and color to Xeriscaping designs. 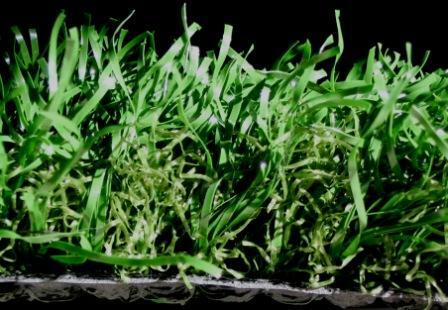 With the new health concerns over recycled rubber, the thick nylon "spring set" thatch layer allows our premium fringe/turfs to be installed with little to no rubber crumb and still provide a soft comfortable surface for bare feet. Contact us directly if you have any further questions at 203-287-0636 or tjb@TJB-INC.com. If you would like a free copy of our installation instructions, please E-Mail your request to the address above and I will reply with a Microsoft Word 2003 attachment. If you do not have Microsoft Word, please let me know and I will cut and paste the instructions into the body of the reply. Sand-Filled Polypropylene Putting Greens: Polypropylene is just a fancy word for a type of plastic. Plastic in this form does not have memory in the fibers. Not having memory in it makes the turf want to lay down (in one direction like a 1970’s shag carpet) which creates an unplayable surface. To correct this, you have to brush ‘infill’ into the turf with sand. Drawbacks: Will not hold its' color as long than a nylon green when installed in a sunny location. Drawbacks: Without infill, this material does not hold a ball as well from more than 30 feet out unless the green is large enough in size to contain ball roll-out. For bird & animal droppings, remove the larger clumps. A little warm water will dilute the remaining mess. Use a paper towel to blot up the mess. A shop-vac would be the best to remove all traces of any organic matter. To help prevent this, trim back or remove any branches that overhang your putting green that a bird can perch on and release a "dump". It does not matter if the surface was a polypropylene, nylon, or a hybrid. 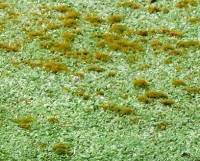 If conditions are right, moss, mold, and algae will grow. Try to allow as much sunlight to reach the green as possible. Wind flow is very important as well. Trim back trees & shrubs to allow natural wind currents to dry out the surface area of the green. Many golf courses use fans to keep the surface of their natural greens dry to prevent fungus and mildew.